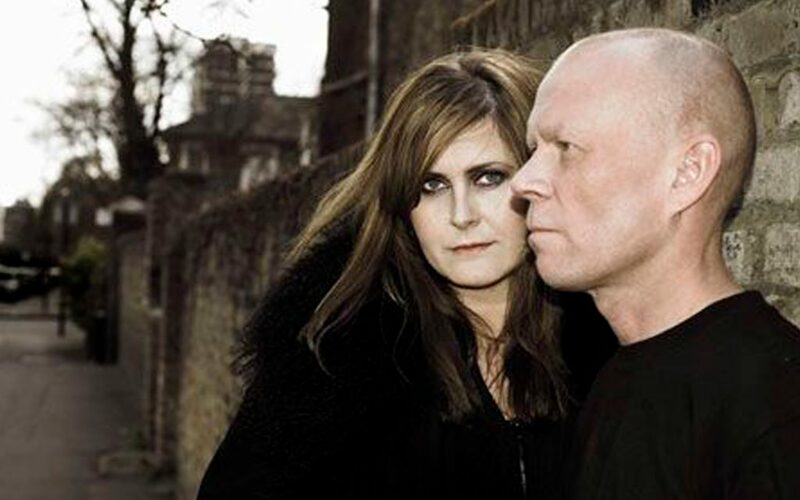 Yazoo are carrying the flag for the human face of chart pop. While everyone else is either trying to pretend that the real world doesn’t exist (Modern Romance) or trying hard to be fiercely alternative (Dexys), Alf and Vince maintain an attitude of reality. They’re the sort of people with whom you can kick off your shoes and loosen your tie. In a word, they’re relaxed. You’d expect from physical appearance that Vince would be the quiet introvert, and Alf would be chatty and outgoing, and to a degree you’d be right. Vince thinks before he speaks, the result of mis-quotation by our friends in the international dailies, but he opens out on subjects that interest him, like work. Alf is shyer than she pretends, but covers it well with volumes of firm opinion, punctuated by the occasional self-depraciating giggle. For most of the time, Alf does the talking for both of them, they seem to prefer it that way. Both Alf and Vince freely admit that their motives for working together are basically selfish. Their success, on a commercial as well as personal level, neatly assassinates the theory that bands, or any group of people who work together in a close-knit unit have to be selfless individuals, happy to sacrifice personality and ambition for the good of the band/party/state etc. As a relatively unknown quantity, you could say that Alf was being cold and mercenary. On the other hand, you could be realistic as she and Vince are, and understand that people who turn down golden opportunities, never get anywhere. Vince, on the other hand, undertook the experiment that became Yazoo for different reasons. Having split with Depeche Mode to escape the grind of pressure to record and tour, and generally be a pop star, it’s easy to see Vince’s reluctance to tie himself to the strings of a major recording contract. Thanks to the more sympathetic relationship with Mute, Vince was able to work at his own pace, and the results have more than justified the faith placed in him. As a major force behind one of Britain’s premier synthesizer pop bands (my opinion not Vince’s), it would have been easy for him to advertise for a vocalist, by trading on his own reputation. “I think this is the only tour we’ll do,” said Alf, dropping that particular bomb-shell in the matter-of-fact tone that suggested that it had all been discussed and agreed some time ago. That explains why Alf continually refers to Yazoo as a “project”. They both seem to regard it it as a pick-up and put-down arrangement, depending on what suits them at the time. It’s a system which other bands ought to seriously consider. As Alf pointed out, being in a band is not like a standard day job, where you either have a job or you don’t. Being in a band gives you a unique opportunity to take time to explore other avenues, without loosing sight of the original idea. 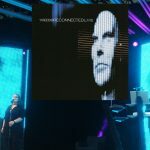 For Vince, the structured life-style of touring proved once again to be too much of a nuisance for him to agree with, especially if he doesn’t have to. Speaking as someone who can just wire a plug, providing you don’t need it in the next two hours, I have a profound respect for anyone who understands the internal workings of electronic devices. I fondly imagined that anyone who works with the kind of complicated gadgetry Vince Clarke uses to make music, must have a degree in physics at least. In fact, Vince’s knowledge of the whys and wherefors of synths and associated devices, is limited to wiring the occasional lead. This meant considerable problems both ethical and electronics, when Yazoo came to try and put the whole show on the road, as Vince explained. If Yazoo are now using standard reel to reel backing tapes, what was the advantage of using the Fairlights in the first place? 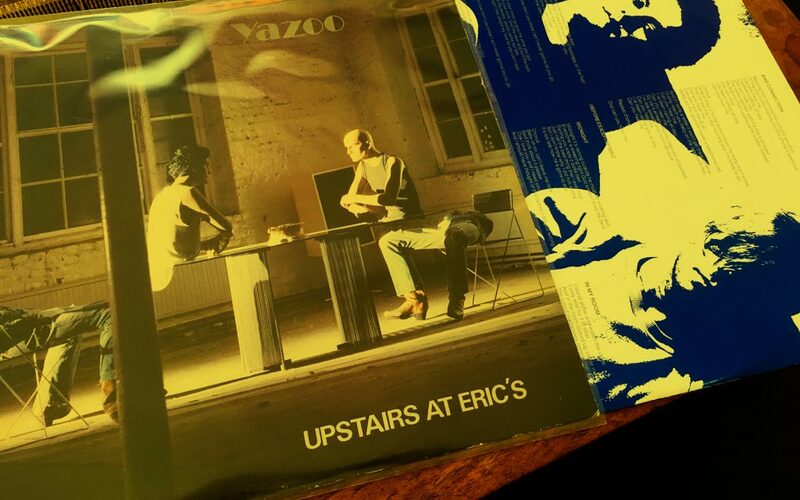 It will be clear to anyone who has either seen Yazoo live, or heard their marvelous ‘Upstairs at Eric’s’ album, that Alf and Vince operate from very different musical spheres. To write songs together involved a certain degree of compromise. Alf elaborates. The underlying attitude here seems to be polite acknowledgement of each other’s territory. Alf wouldn’t tell Vincent how to programme a synth, and Vince wouldn’t pick on the subleties of vocal phrasing. It’s an understanding that’s vital if any sort of partnership is to succeed. Yazoo find it easier than most, because their entire relationship is based at a professional level. It’s a common belief that bands spends every waking hour in each other’s company. The more enduring bands have realised that any group of people who spend too much time together, get on each other’s nerves, and breakup is just around the corner. The solution is to maintain the right balance between friendship and business, The Rolling Stones are an object lesson in survival, they work it by only getting together to record, or tour, living totally separate lives away from the band. This keeps relations between them at the right level. Close enough to work, distant enough to tolerate each other for long periods when necessary. Alf and Vince have managed to strike this crucial balance from the earliest days of their career. “We have different opinions in the studio, and different tastes, but we’re generally pleased with the result,” said Vince summing up his opinion with characteristic simplicity. Alf was a little more thoughtful. How many times have you really loved a certain band’s early albums, and then been disappointed or even downright disgusted at the apparent lack of care that goes into later efforts? 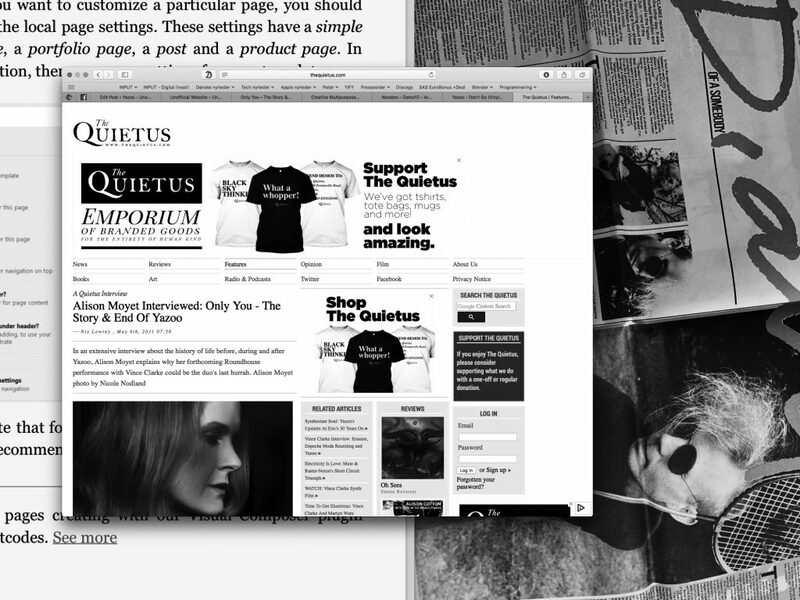 At the risk of enduring vehement abuse, I have to cite Supertramp as a prime example. I thought, and still do think, that ‘Crime Of The Century’ is one of the finest albums in my collection. Now, thanks to their total absorbtion into the American superstar syndrome, they’ve lost the bite and creative edge that made them so very good. Why? Because they don’t have to try anymore. If they turn out substandard, or even duff albums, people still flock to buy them, so where’s the motivation to even try and write decent material? Yazoo have reached the stage where their live performances are greeted with enthusiasm before they’ve actually done anything, so doesn’t it take the edge off their efforts? At a time when apparently secure and successful bands are going down like nine-pins, it’s no longer safe to assume that favourites will continue to pump out songs until they end up tilling the allotment. Looking at the way some bands have slid from urgent vibrant force into sluggish FM non-entries, it gives evidence for a compulsory break after the peak of creativity have been reached. Since Yazoo are one of the successes of 1983 what about it Alf? Those who saw Alf solo on B.A. Robertson’s show will be well aware of her homage to traditional blues music, and her ability to interpret the style with rare skill. Surely there must be something involving the blues in the future? There we had to leave it, as Alf and Vince were long overdue for dinner. We shook hands and commented on the realization that as the interview progressed, we’d all learned to relax and enjoy it. As they went off to eat, I reflected on the unique aspect of the conversation. This is the only interview that Yazoo have done while on the road, and since this may be their first and last tour, it’s a bitter-sweet satisfaction. It’s possible that Alf and Vince are paving the way for a new style of band. Everyone is famous for fifteen minutes, but at least they leave something worth enjoying after they’ve gone. Think about it. Originally printed in the November 1982 edition of Zig Zag magazine. Reprinted without permission for non-profit use only.